This whole dish is fabulous. Come on, just look at those ingredients. Let's start with the chicken. The secret to really good chicken is not overcooking it. One of the best purchases I have made has been an instant-read thermometer. I realized I had been way overcooking my meat. Perfectly cooked chicken means tender and juicy and when you add an amazing rub like this one, it will have you begging for more. This rub has become a go-to for me, because it adds so much flavor without having to marinate the chicken. 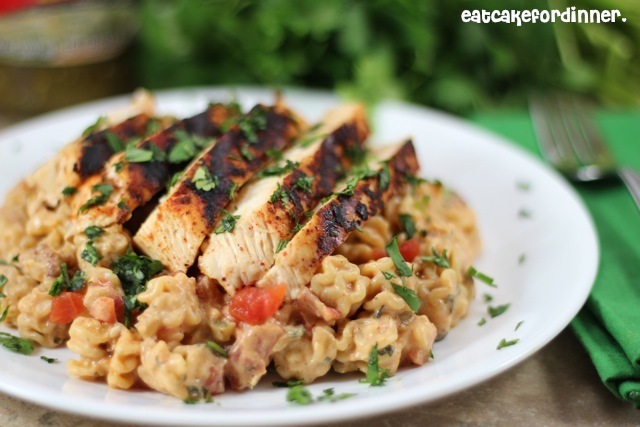 The pasta portion of this dish is good enough you could eat it as your meal without any meat. 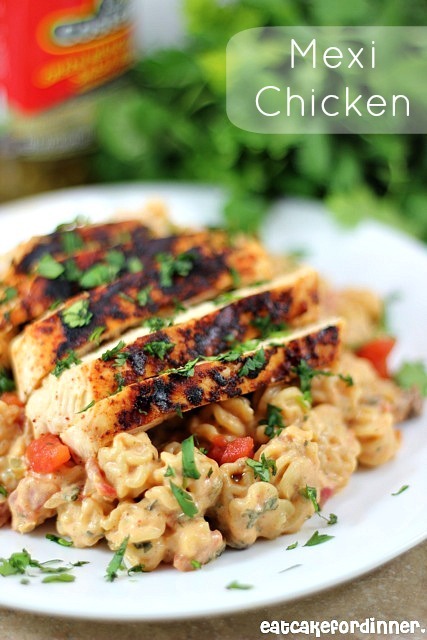 It is super creamy with a little heat and I added the same spices used in the chicken rub to tie the two together. So so good and easy enough for a weeknight. For the chicken: Combine ancho chili powder, smoked paprika, garlic powder, salt and pepper; season both sides of each chicken breast with the rub and set aside for a few minutes to allow the chicken to absorb some of the spices. Then, grill on the George Foreman or cook in a skillet over medium heat until internal temperature registers 165 degrees on an instant-read thermometer. For the pasta: Cook pasta according to package directions; drain. Meanwhile, heat olive oil in a medium skillet over medium heat. Add the onion and chopped peppers and saute for a few minutes or until tender. Stir in the half-and-half, salsa verde, diced tomatoes, chili powder, smoked paprika and cilantro. Allow to cook, stirring occasionally, until heated through. Add the cornstarch/water mixture and continue cooking until thickened. Stir in the cooked pasta. Jenn's Notes: This chicken rub has become one of my go-to rubs. It goes great with many other dishes. I have also made this pasta recipe and added cooked sausage and served without chicken and that was great too. That rub sounds fantastic! Then all combined with the pasta, my kinda dish! This dish sounds so easy and so tasty! Chicken dishes are my favorite Dinner choices, thanks so much for sharing! Pinning to my "Mexican food" board. I am so glad you liked it - thanks for letting me know! What a delicious looking dinner! Both the chicken and the pasta sound wonderful! According your recipes i made Chicken Pasta Dishes last night. really It's a super creamy with a little heat and I added the same spices used in the chicken rub to tie the two together. thanks for sharing this recipes. Hi Jenn, this looks great! Is it kid-friendly or is a little too spicy?